Our large aircraft models make great gifts for birthday, retirement or other special occasion! Purchase a large model gift certificate and you’ll receive an impressive printed certificate with a unique code. 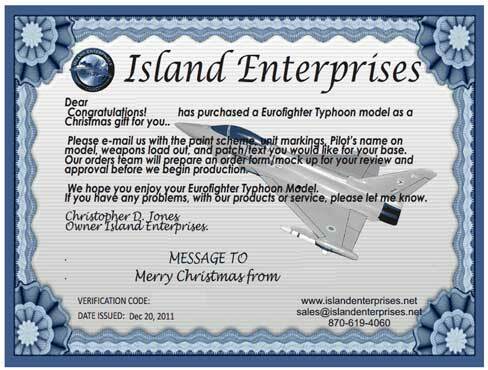 Your recipient will be able to use the Island Enterprises web site to customize the model, and will receive the completed model in our standard service period of 8-10 weeks (optional rush service at additional charge).